Nineteenth century Americans loved a good courthouse. 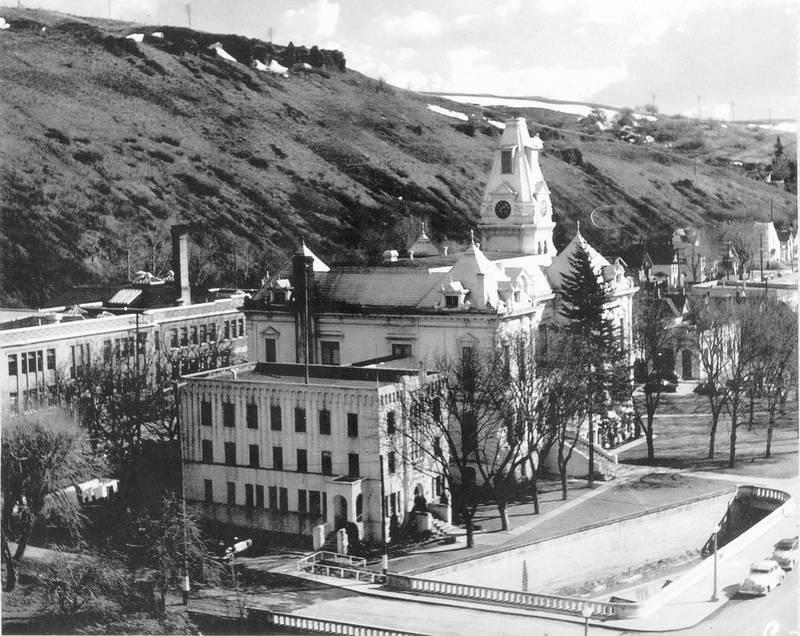 Here in 1889, the residents of Whitman County constructed a grand gothic palace of justice that stood prominently until 1957 when it was torn down and replaced with a modern courthouse the same year. Palatial courthouses stood for law and order and the civilizing of the frontier. But there was another, more dubious tradition in the American West, one of lynching and extra-judicial violence. In the spring of 1894, two men sat in the Whitman County Jail in Colfax, both awaiting their fate. George F. Parker was accused of murdering A.B. Cooper on October 17, 1893 in Pullman during a botched robbery attempt. Ed Hill had been charged with the killing of Langford Summers on November 5, 1892 in nearby Garfield during a "drunken spree." Hill was set to be released, convicted only of assault for the stabbing death of Summers, while Parker was still awaiting trial for Cooper's death. Around 1:00 am on June 1, 1894, a man knocked on the jailhouse door and when the guard opened it he was overtaken by a group of armed men who used his keys to open the cells of both Hill and Parker. The two men were forced upstairs at gunpoint, bound, gagged and had nooses affixed to their necks. While Hill yell and swore, Parker seemed to accept his fate and remained calm. They were both thrown off the second floor balcony where the nooses strangled them to death, rather than their necks being snapped. Most local residents were incensed that such barbaric justice was tarnishing their town so late in the 19th Century. Colfax would not experience another such incident, at least not for another four years. As 1897 turned into 1898, Chadwick "Blackey" Marshal and Robert "Dakota Slim" McDonald sat in the Colfax jail (in the basement of the courthouse), in the midst of their trial for the murder of Orville Hayden in Farmington in 1897. On the night of January 8, 1898, a posse of around twenty heavily-armed men arrived at the courthouse jail "with revolvers cocked" and demanded the two prisoners. A rope was fastened to Blackey's neck and he was dragged upstairs to the superior courtroom where he was thrown headlong out of a second-story window and hanged. The mob next went after Dakota Slim who had stuffed rags in the keyhole of his cell door, preventing entry. Catching a glimpse of his shoulder, someone shot him, at which point he convincingly feigned death. The Whitman County Sheriff released Dakota Slim the following morning on account of Blackey's "confession." Seven years later, after he was arrested for a crime in Nebraska, Dakota Slim confessed to the murder of Orville Hayden in 1897. This meant they had lynched the wrong man - Blackey did not kill Hayden. Chadwick "Blackey" Marshal was the last man to be lynched in Whitman County. Capitol Journal, June 2, 1894: The news of the Hill and Parker lynching was reported in this Salem, Oregon newspaper, along with dozens of other publications across the nation. 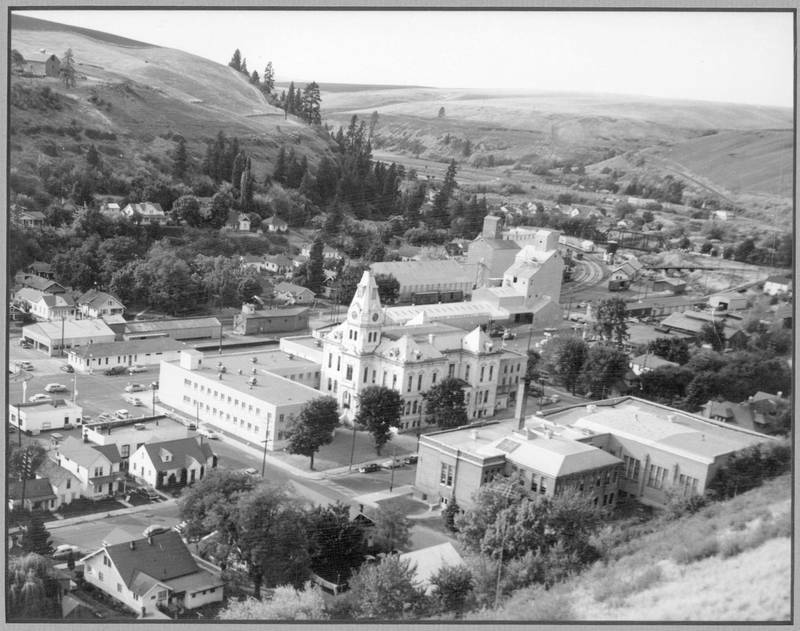 The killings made Colfax, WA famous as a frontier town that actively utilized violent forms of vigilante justice. 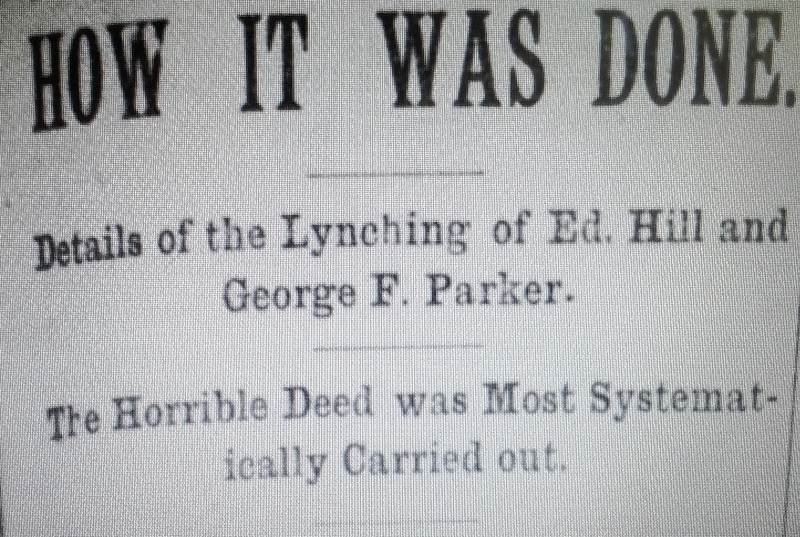 Pullman Herald, June 8, 1894: As seen in this title, the news of Hill and Parker's lynchings were not well-received in neighboring Pullman, WA. Vigilante justice was seen as a barrier to the growth of frontier towns. The idea that potential settlers might stay away from the Palouse region because of the extra-judicial forms of violence taken up by residents was frustrating to most city fathers. who decried such unsanctioned violence. Daily Morning Astorian, January 9, 1898: The courthouse lynching of Chadwick "Blackey" Marshal and the attempted lynching of Robert "Dakota Slim" McDonald made headlines across the country. 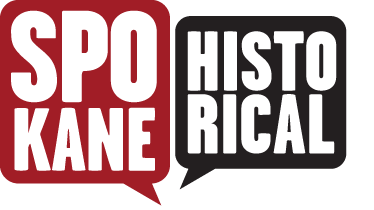 Lynching as a form of justice was falling out of favor as more and more Americans were becoming disgusted by excesses of vigilante justice. Spokesman-Review, January 17, 1898: A superior court judge in Whitman County was furious about the murder of the desperado and attempted murder of the other in his courthouse. Judge McDonald demanded an investigation into the lynching, as well as the guard on duty that night, stating that the jailer had "failed and neglected to perform his duty." A grand jury was called, but no indictments were ever handed down to any of the vigilantes. Pullman Herald, December 30, 1905: In this edition of the Pullman Herald, the truth about what really happened the night that Orville Hayden was murdered came out. 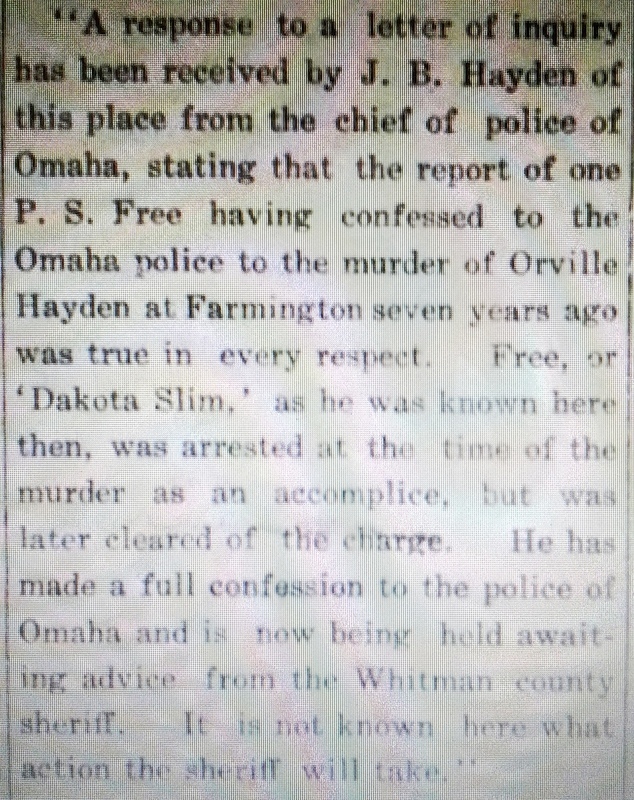 Dakota Slim was arrested in Omaha and at some point during his conversation with a detective, Dakota Slim confessed to being the trigger man the night Hayden was killed. 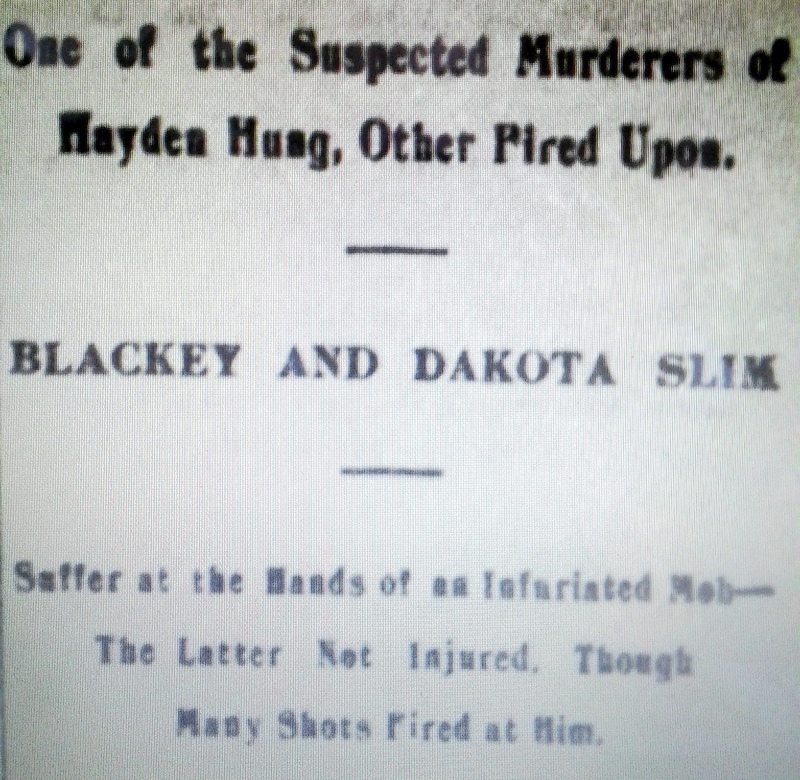 Apparently the guilt of Blackey's death at the hands of the mob had caught up with Slim who admitted in 1905 that he had been the one who had shot Hayden, not Blackey. It was too bad that he did not make the confession the night that his partner was lynched. Further proof that there exists no honor amongst thieves. 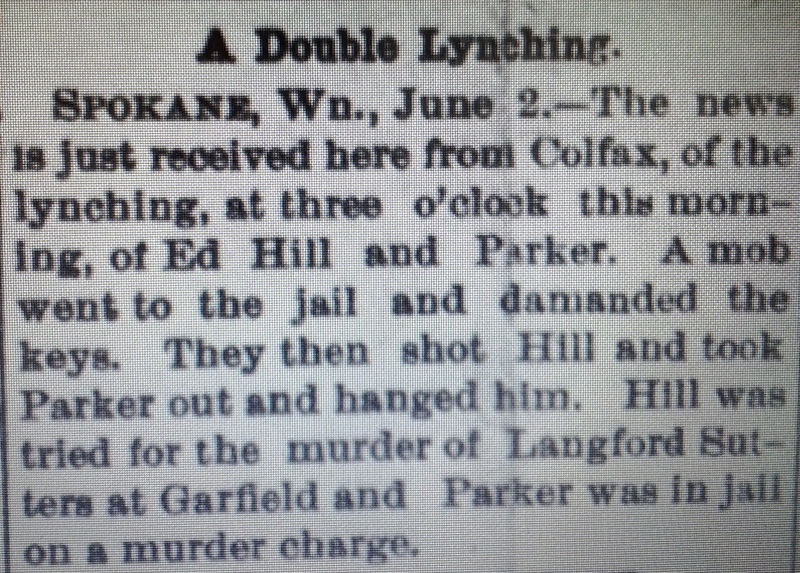 Robert M. Lambeth, “Frontier Violence in Colfax: The Courthouse Lynchings,” Spokane Historical, accessed April 20, 2019, https://spokanehistorical.org/items/show/434. "How It Was Done." Pullman Herald, June 8, 1894. "Change of Venue." Pullman Herald, December 8, 1893. "Ed Hill is to Go Free." Philipsburg Mail, April 12, 1894. "Mob Lynched their Man." 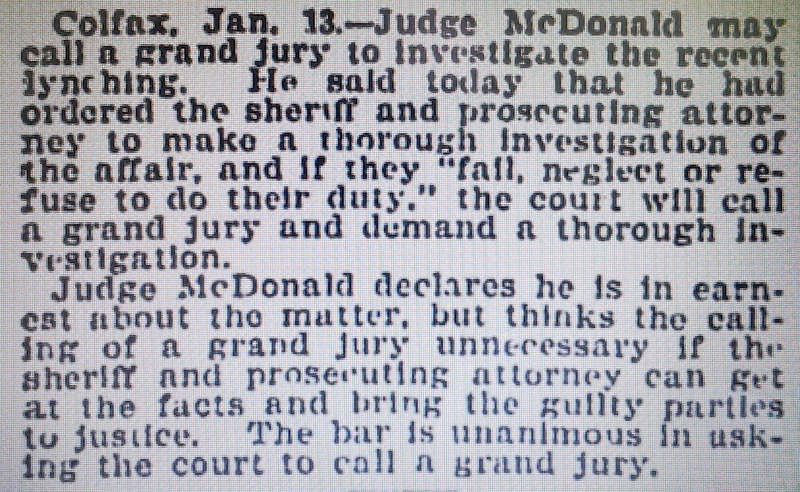 Pullman Herald, January 15, 1898. "That Colfax Lynching." Adams County News, February 2, 1898. "Says he Killed Hayden." Pullman Herald, December 30, 1905.